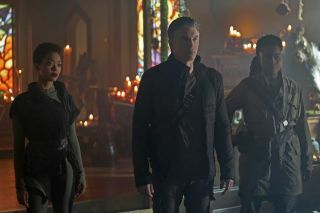 Michael Burnham (Sonequa Martin-Green), Christopher Pike (Anson Mount) and Joann Owosekun (Oyin Oladejo) go undercover on the planet Terralysium in the Beta Quadrant. The second installment of "Star Trek: Discovery's" sophomore season, "New Eden," picks up straight after last week's episode as Michael Burnham (Sonequa Martin-Green) shows Capt. Pike (Anson Mount) the recorded message she found in Spock's quarters on board the USS Enterprise. It seems that Spock had some idea about these red bursts before they began to appear. The captain and his science officer are summoned to the bridge as another red burst signal has been detected. The USS Discovery warps to a new spot to get a better fix on its location, which is in the Beta Quadrant, apparently. Since this is 51,450 light-years away and would take 150 years to get there, Pike approves use of … the spore drive. Ugh. Yes. indeed, the "displacement activated spore hub" or DASH drive — or just "spore drive" as most call it now — has made its first appearance in Season 2. Poor Lt. Stamets (Anthony Rapp) is reluctant to go through it all again, not least because when he was lost inside the mycelial network in the episode "Vaulting Ambition" (S01, E12), he saw and interacted with an apparition of Dr. Culber (Wilson Cruz). The good doctor —– and Stamets' partner — was shockingly murdered by Lt. Tyler/Voq in what may have been the best episode of Season 1, "Despite Yourself" (S01, E10), so it's no surprise that even the possibility of seeing him again would be distressing. The crew prep for black alert, a phrase we hoped we'd never hear again, and the Discovery does its fidget-spinner thing. There's a great POV camera angle from the perspective of the actual hull as it rotates, but it's barely a second long and if you blink you'll miss it. Incidentally, this episode is directed by Jonathan Frakes and written by Sean Cochran, the same writer-director combo behind that excellent Season 1 episode "Despite Yourself," so our fingers were crossed that this would be better than last week's attempt. Emerging at the correct coordinates, the Discovery can detect no sign of a red burst signal, but instead finds an M-class planet, with human lifesigns and a strange distress call that's been broadcasting for more than 200 years. There should be no human settlement this far from Sector 001 and the very first warp flight was only 193 years ago, so there hasn't been enough time for anyone to get this far. Très bizarre, non? And the opening credits roll. Meanwhile, Tilly (Mary Wiseman) is mucking about with her meteorite in the cargo bay and confirms that it does contain metreon particles, which react with dark matter and have some kind of temporal properties. She attempts to take a core sample and provides helpful exposition along the way. But as she gazes at her wondrous new rock fragment, a sudden and mysterious energy discharge sends her flying across the room, knocking her unconscious. Pike, Burnham and Owosekun beam down to the planet's surface in location-appropriate clothing. They enter a church and determine that the structure is indeed 200 years old. One of the stained-glass windows features a figure that vaguely resembles the angelic image associated with the red burst signal. The door opens and in walks a member of the settlement who demands to know why the three of them are not at work in the fields. Pike does an outstanding job of improvisation and they are taken to meet the village elders. A welcoming ceremony is performed and we can see glimpses of historical influence; red — like the mysterious signals — is a prominent color, reference is made to soldiers and the third world war, which ended in 2053 with the loss of 600 million lives. There's even a brief glimpse of what looks like a WWIII soldier in armor that we saw in the very first "Star Trek: The Next Generation" episode, "Encounter at Farpoint." The Discovery away team is intrigued by the story and we learn that as the bombs began to fall and the devastation started, a red angel appeared and took those who had taken refuge in a church — along with the church itself — to their new home, the planet they now call Terralysium. Capt. Pike in the New Eden settlement on the planet Terralysium. The episode's pace is so much slower than that of last week's episode, and it gives many of the characters a welcome opportunity to show us more. Just watching Pike listen intently to the settler's story, with only the crackle of the campfire in the background, makes us feel that we're seeing more of his personality than we ever would watching him fly around, dodging asteroid debris in a VFX-heavy, Abrams-esque set piece. We learn that the settlers have a now-nonfunctional helmet-cam from a soldier in the war, which, in the early days, was among the only evidence they had of their origins. And we're back with Tilly, who is recovering in the sick bay and receiving a lecture from Saru on the dangers of dissecting a highly unstable interstellar asteroid with no assistance. How many of us are guilty of doing that at some point? She attempts to explain that she's trying to design a coherent resonator to work with the spores, essentially building a dark-matter interface so that Stamets will no longer have to suffer each time they use the spore drive. Saru draws upon his own experience as being the only Kelpien to enter Starfleet to relate to Tilly's burning desire to go through the command training program, while simultaneously trying to give a lesson on caution and responsibility. His pep talk is interrupted when the Discovery's sensors detect a massive spike of ionizing radiation in the planet's upper atmosphere. It also seems that there's been a disruption of the gravitational stability of the planet's outermost ring, and it's about to start raining down radioactive particles onto the surface … causing nothing less than an extinction-level event. Naturally, the radiation is interfering with both communications and transporters. What about using a shuttle, you ask? Stamets leaps like Baryshnikov from the turbolift just in time to explain that the shuttle's ionized carbon exhaust will create a runaway positive feedback loop that will accelerate the particles' arrival. Damnit. Saru postulates that a rescue might be the very reason they were led to this location by the red burst signal. Many miles below, on the planet's surface, Pike, Burnham and Owosekun discover the source of the transmission in a basement under the church. Down there, among the cobwebs and covered in dust is some still-functioning tech. A villager named Jacob (Andrew Moodie) enters and tries to convince the Discovery crewmembers that he knows they're not from Terralysium. Pike sticks to his principles and vehemently denies it. In a desperate attempt to stop them from leaving, Jacob throws a stun grenade at them. The trouble-stricken trio wakes up locked in the basement with all of their tech missing, but Owosekun breaks them out by using an improvised magnet to slide the bolt back. Tilly is having a panic attack in the sick bay and with the help of an as-yet unnamed crewmember (Bahia Watson) she reasons that perhaps they could attempt to slow down the particles from orbit. If only there was something onboard Discovery that could generate a powerful gravitational field. (Clue: the meteorite in the shuttle bay.) She runs onto the bridge in only her hospital gown and blurts out her plan. Saru (Doug Jones) takes charge on the Discovery to avert an extinction event for the planet below. During his motivational speech to her earlier in this episode, Saru lets us know by way of exposition that Tilly is the youngest cadet to ever be accept onto the command training program … but just how young is she supposed to be? Based on her behavior in this episode, we can only assume she's still a teenager. And if she's going to make it through the training program she's going to have a shock when she has to learn some discipline, self-restraint and responsibility. Back on Terralysium, Jacob attempts to convince the other settlers of the Terralysium town, New Eden, that Pike, Burnham and Owosekun are from Earth, putting the away team in a very awkward position. Don't forget, no one on the surface knows they are about to get microwaved like a TV dinner in less than 20 minutes. Suddenly, a small child picks up a phaser and accidently sets it to overload, making Pike leap, grab the phaser and smother it without so much as a microsecond's hesitation. Tilly's technobabble plan works and the Discovery prevents radioactive particles from bombarding the surface. As you can imagine, Pike's wounded pretty badly, but not, thankfully, blown into a billion bloody pieces, which is what normally happens when a phaser is set to overload. Burnham grabs their tech and says that they will carry Pike to the church to pray for another deliverance, slamming the door in poor Jacob's face. He kicks it open to see the away team being beamed back to the Discovery. Turns out that the as-yet unnamed crewmember was the ghost-of-sorts of an old school friend of Tilly's named May Ahern, who died only a few years ago. Has Tilly gone full Tyler Durden? Quite possibly. Is this some kind of influence of the red burst angels? Also entirely possible. In a nice twist, following another great scene with well-written dialogue between Burnham and Pike in his ready room, the captain beams back to the church basement to tell Jacob that he was right and explains why they cannot intervene. It's a touching thing to do; despite not being able to help, at the very least Jacob now knows the truth … and he shuts down the repeating transmission. "Thank you," he says. "Because of you, we know we're not lost anymore." Pike offers him a sizable powercell to assist in their gradual colonization in exchange for the nonfunctional helmet-cam, and the two share a meaningful handshake. It's a touching moment that echoes the best of "Trek." Alone in his ready room, Pike plays the final recording…revealing a now familiar, angel-like image. So, Spock is still a no-show, some more members of the bridge crew finally have lines, including Lt. Airiam (Sara Mitich) and Lt. Detmer (Emily Coutts), Tilly continues to dance equally on either side of annoying and interesting and Pike is maturing nicely. While we did like Kurtzman's creative edits and camera angles last week, please let Frakes direct more episodes of "Star Trek: Discovery." The first season of "Star Trek: Discovery" is available to stream in its entirety on CBS All Access in the U.S. and on Netflix in the U.K. "Star Trek: Discovery" Season 1 is available now on Blu-ray. The second season of Star Trek: Discovery comprises 14 episodes with no midseason break. It airs on Thursdays on CBS All Access in the U.S. and on the Space TV channel in Canada, and in the rest of the world on Netflix on Fridays.